Renovation of a Flower Bed... And Peas Sown! 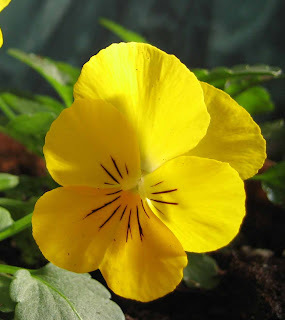 When I went out to get the newspaper very early this morning, I realized that it was quite cold and the violas and pansies got their first experience of below freezing temperatures. But by mid morning, with the sun shining on them, they were fine again. That's what I like about these flowers, their resiliency when it comes to below freezing temperatures. I don't know why we refer to weak, scared people as "pansies". Call me a pansy any day! They are tough flowers. Yesterday after I planted all the pansies and violas, I did some more digging to enlarge my perennial bed along the patio and backside of the house. Here's a picture to show how far I got on Friday. 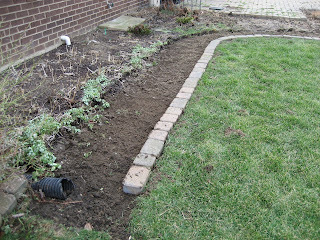 Then earlier this afternoon I did a litte bit more sod removal, and now I am nearly done. I do need to extend the downspout drainage pipe a bit, and I think the inside curve isn't going to be good for mowing around, so I need to fix that. But it won't take too long to finish, perhaps another hour or so. Then once all the different perennials start sprouting, I'll dig them out, add some compost and replant in my bigger beds. I do agree that the inset of the patio calls for a manmade structure of some kind but I'm not sure what it will be. I need to think about it and look around because whatever it is, it will bring some style to the garden. Should I go with something classical? Whimsical? Country-cal? Oh, and did I mention I planted peas today? St. Patrick's Day is a traditional day for planting peas, so I went for it, even though I don't think it got above 50 degrees. I also sowed lettuce, spinach, beets, and radish, and I planted onion sets. Guess which bed I planted? 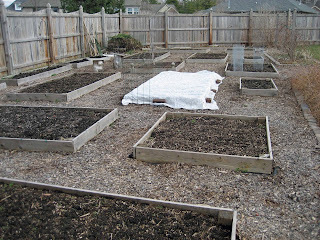 Yes, the one covered with white cloth, where the tomatoes were last year. I am using the cloth covering to try to give the seeds a chance to germinate and grow a bit before the rabbits get to them. I know the rabbits are still there. I scared one out of the nearby Forsythia shrubs the other day. (The Forsythia that haven't bloomed in 9 years!) While I was out there today happily sowing my seeds, I felt "watched" by little black rabbit eyes lurking under a nearby shrub. Or maybe it was the garden fairies, watching to see if I would leave my gloves on the ground again? Last year, I "lost" some gloves somewhere in that garden area. They were green (naturally) and I looked all over for them, but never found them. 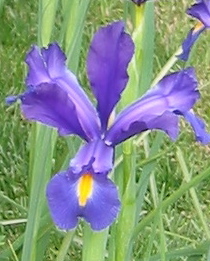 I thought I might find them after I cleaned up the garden last fall, but I didn't and I still can't find them. So you tell me, what could have happened to them? This is looking so good...how exciting to see it taking shape! Might it be rabbits who snuck off with your gloves? I have to confess that I once found the missing mate to a pair of gardening gloves when I was digging up tomato plants one fall. Great work! Removing sod is always so much fun. It looks like you've got a lot of space for planting. You did a lot of hard work but the beds look fine now. Lots of space for the plants to grow in. I think the style of your house is very important in deciding what to go for with your patio. Oh, I want some of this ready-to-plant space! Looks so inviting...I'm sure you are eager to get going! 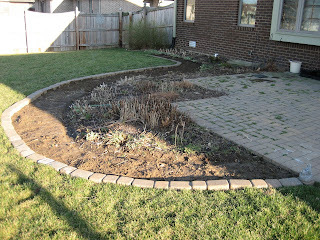 A manmade feature would look nice in that cut-out in your patio, but how about a medium-size ornamental grass instead? 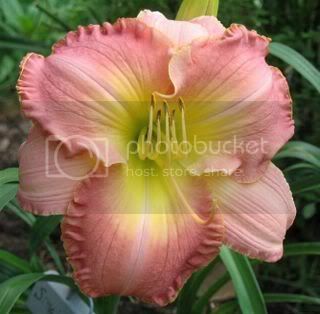 I can see it softening the edges of your patio and bringing some movement and height to that space. If the sun comes up or goes down on the other end of your yard, you'd be able to enjoy the backlighting of the grass's inforescence. Best of luck with those peas! I had a disappearing boomerang in my garden. My neighbour's grandchildren threw it over the fence by accident, and although they told me where it landed and I searched the whole garden several times, we were never able to find it. I vote for a whimsical water feature of some sort. That is the ONE thing your garden lacks -- a water feature. Or maybe you should go all out and have an inground pond added?